Features the Grand Canyon of Yellowstone. Canyon Sheet. Topography Sheet VI. 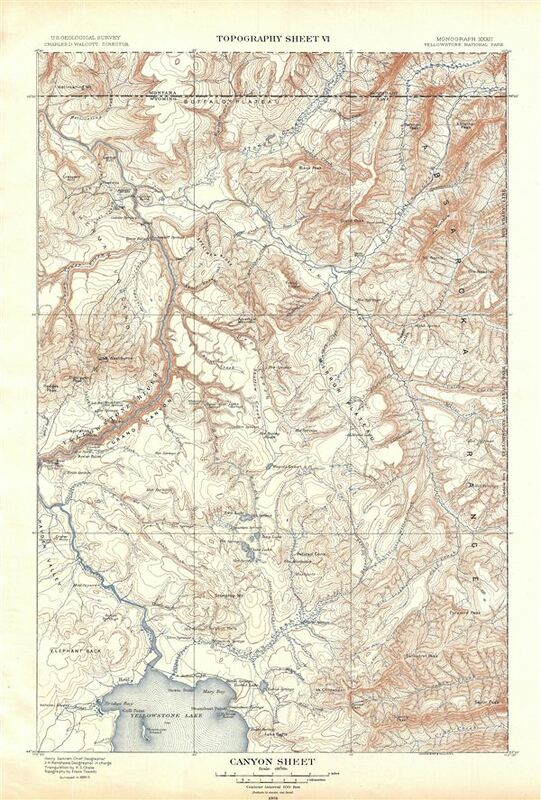 A fine example of Arnold Hague's 1904 topographical survey map of the spectacular Grand Canyon of the Yellowstone National Park, Wyoming. The map covers the entire Canyon Region and the Absaroka Range from the Yellowstone Lake northward, along the Yellowstone River, as far as the Hellroaring Creek in Montana. Throughout countless well known Yellowstone sites are noted, including Elephant Back, Mirror Plateau, Sherman Volcano, and Fossil Forest, as well as various springs, peaks, creeks and lakes. Measuring roughly twenty miles long from the Upper Falls to the Tower Falls area, the Grand Canyon of the Yellowstone is known to be the most breathtaking sight in the Yellowstone National Park. The boundary line between Montana and Wyoming runs along the breath of the map on the top. This particular map was part of Hague's study of the regions unique geology and the related geothermal activity. Published by the United States Geological Survey in 1904.